Whizz has been backed at the start of 2019. She has a forward willing attitude, excellent conformation and off the floor paces. Whizz is very athletic over fences and has a wonderful technique. She competed at the BEF Futurity gaining and excellent mark. She has been started under saddle and is snaffle mouthed. Recently started jumping some small fences under saddle and is now ready to produce for the 4 year old classes. Although Whizz was only started as a 4 year old, she is quiet to do anything with. She hacks alone and in company. Wessex staring Role x Malibu. 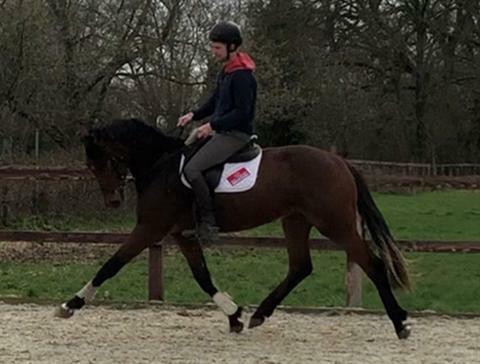 Wellingrove is a well put together young horse to make 16:3hh. His hindquarters are particularly good and show great promise for showjumping or eventing. Wellingrove’s dam Woodlander Malibu has produced stunning foals over many years. Her mix of Happy Girl and Olympic Cocktail breeding paired with sire Wessex Starring Role's sport performance credentials has produced a young horse with an excellent future ahead of him in hunter show classes, eventing and hunting. Wellingrove has his sire’s laid back and easy temperament; his lovely looks and his willingness to work. Easy to work with on the ground, Wellingrove is now ready to commence his ridden career. He has a very trainable temperament and had no vices. 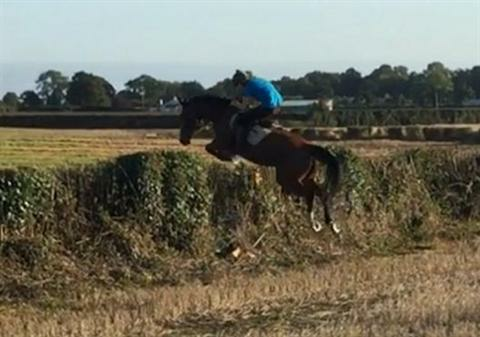 Wellingrove is proving to be brave out hacking and over fences on the lunge. With a lovely temperament, clean limbs and excellent conformation, he is a great prospect for any sport and is destined for great things . He is hacking alone and in company and has been produced well on the flat. He will be introduced to fences in the coming weeks. Wellingrove would be an ideal candidate for the young horse classes and has enough ability to go to the top in any sphere. He would also be an ideal candidate for showing. This beautiful example of a horse is conformationally correct, very expressive on the flat and has great jumping technique. 4 year old filly who was broken in last year and after her break is now under saddle. Leila is forward thinking and shows all the attributes to be a top performance horse. Leila is a charming young mare with correct limbs and movement. 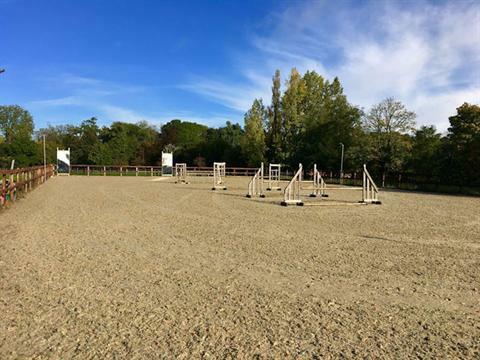 She will make 16:3hh and is perfectly designed for eventing. Her international showjumping sire Landor S has delivered consistently at the highest levels of the sport (http://eurostallions.ie/product/landor-s/) and her State Premium Hanoverian dam, a direct daughter of Olympic performer Rubin Royal, ensures Leila’s provenance for top class rideability. She is best suited to a professional rider that wants to take a well bred mare up the grades. She moves correctly and expressively with a beautiful head and limbs. Her Landor S sire has a long history of Olympic discipline performance sport on record and her State Premium Hanoverian dam Rubiana exhibits all of the characteristics of her Rubin Royal dressage lines. She is sweet in the ground, loads perfectly and is an easy character to have on the yard. By Welton Double Cracker out of a double graded Hannoverian Oldenberg dam. Wilton is currently being backed and produced lightly. 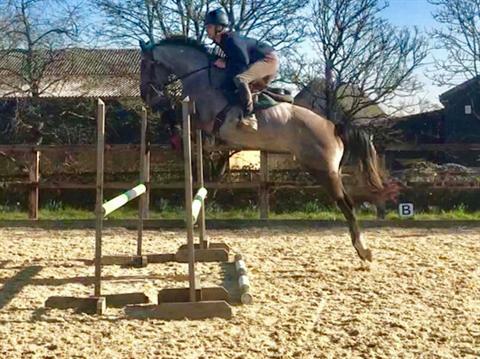 Wilton’s bone and limbs are perfect and his showy markings make him an attractive prospect for hunter trials, eventing or showjumping. His Advanced eventing sire Welton Double Cracker delivers the best in sport performance and his double graded State Premium Hanoverian/Oldenburg dam Rosinante has produced a long line of lovely foals. Wilton is now hacking out quietly, loose jumping and showing terrific scope. 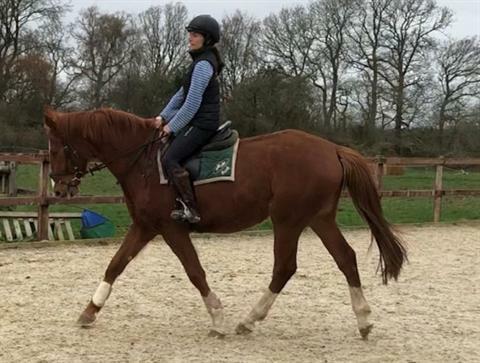 He will suit a sensitive rider looking for a lovely horse to produce up the grades. Wilton is hacking alone and in company and has been produced well on the flat. He will be introduced to fences in the coming weeks. Wilton would be an ideal candidate for the young horse classes and has enough ability to go to the top in any sphere. He would also be an ideal candidate for showing. Wilton is proving to be brave out hacking and over fences on the lunge. With a lovely personality, clean limbs and excellent conformation, he is a great prospect for any job . Fargo is being lightly produced and backed and is showing the temperament and athleticism to go to the top. 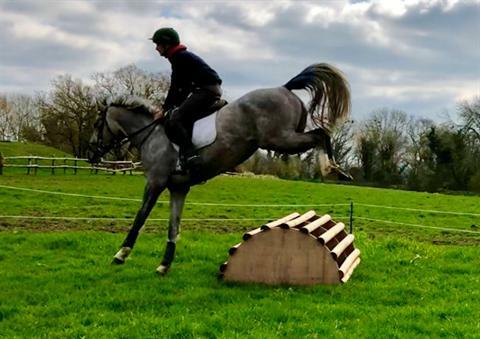 Fargo is a fine young horse with great conformation and a lean frame particularly suited to eventing. His KWPN registered show jumper sire Fransje and his State Premium Hanoverian dam, a direct daughter of Olympic performer Rubin Royal, ensures his promise of top class sport. His relaxed character has made is early training easy and his willingness to work and learn is assured. He looks beautiful and will catch a judge’s eye in the show ring. He hacking out happily and is ready to start more formal training to prepare him for young horse classes. Fargo would be an ideal candidate for the young horse classes and has enough ability to go to the top in any sphere. Fargo has a very trainable temperament and had no vices. With a lovely personality, clean limbs and excellent conformation, he is a great prospect for stellar sport. Trenavey Sea Heir X Limbrina. 5th National breed show (SHBGB) loose jumping. Currently standing at approx 16hh to make 16.2hh when mature. Elf is a super young horse who has the most trainable attitude. She has excellent technique over a fence, with the movement that will produce top scores in eventing. This filly has a high % of blood and will no doubt be one for the age classes next year and beyond. Elf is walking, trotting and cantering under saddle and has popped a fence. She was also 5th at the SHBGB National breed show. Elf is out of Limbrina, a beautifully bred Hanoverian mare who was a kind and consistent horse under saddle, but retired perfectly sound to the paddocks aged 8. She is by the dual purpose jumping/dressage stallion, Limbo, out of a mare by the legendary Pik Bube. Limbrina’s offspring range from an Advanced Medium dressage horse, to an open team chase/hunting star, an RC team stalwart, never out of the ribbons in jumping, eventing, or dressage, and an elite eventing foal, 5th at the Osberton Event Foal Championships, later sold to a competitive amateur dressage rider. Elf’s sire is Trenavey Sea Heir, the only entire Thoroughbred son of the great Kuwait Beach, No 1 eventing sire in his day and father of Ingrid Klimke’s immortal Sleep Late. Trenavey Sea Heir has some very nice young progeny out on the eventing circuit, most notably Kitty King’s super young horse, Drewmain Firefly (destined for the top until tragically lost to colic recently) and Langaller Sea Fox, ultra-consistent, seldom out of the top ten and now aiming at 1*. Aidan has hunted with the Kildare and Meath hunts along with many other guest days across Ireland. Would suit somebody to either hunt, event or showjumping. Move straight and works on the flat like an event horse. He has a flashy walk, trot and canter. Has hunted and Aidan is independent enough to hunt up the front or mannerly enough to stay down the back. Winner BD on his first two outings with over 71%. He has the movement to go up the grades. All aboard is a forward thinking animal who loves to jump. He has typical ID jumping technique and scope. He has been ridden by teenagers and small ladies. All aboard would suit someone to do dressage, hacking and jumping. He would also suit someone that would like to introduce him to hunting. If not sold he will continue to compete and hunt. Jumping videos to come in the following days. Her dam Witches Broom is full TB. When graded with SHBGB in 2009, collected the highest score in their history at 9.64. Still 5th highest. 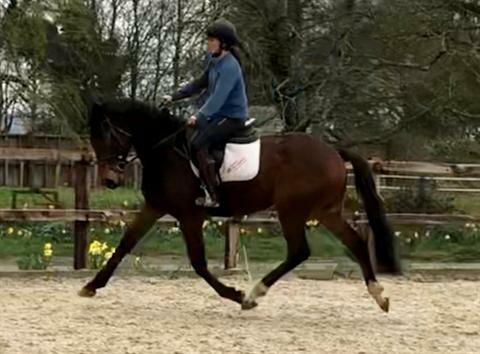 16.2hh approx mare. Lottie has been taken on slowly and produced to a high standard. She has effortless off the floor paces and excellent jumping technique and the temperament for top sport. Lottie is conformationally correct and has has no stable vices or quirks. She would suit an ambitious amateur or professional alike. Full history known as sold direct from breeder. Lottie was placed 4th at the SHBGB championship show for performance horses as a 3 year old. Lottie has been lunged over numerous xc fences, water, ditches etc. showing a great attitude to all. She is ready to be produced for the Burghley 4 year old qualifiers.